Six months after an ankle fracture and an equal period binge eating chocolate and cakes, I decided it was time to get serious about my health. In line with all good New Year’s resolutions, I searched around for a retreat and late January, I checked in to a top-rated wellness retreat, Phuket Cleanse and somehow stumbled upon the fascinating Bioscan diagnostic tool. With a jam-packed schedule, I attacked classes like Muay Thai and weight training with vigor. While I could see some benefits (weight loss and a looser fit on my pants), I was fatigued and bone-weary; each passing day a struggle to maximize my training efforts. A trip to Lyfe Medical Wellness provided a turning point in getting to the bottom of this chronic lethargy. I came to Lyfe Medical Wellness on a recommendation from Phuket Cleanse to get some ozone therapy. While this provided a huge cellular energy boost, it was the bonus of their Bioscan machine that finally provided me with some health answers to my flailing energy levels. The Bioscan reads imbalances in your body’s magnetic field. The Bioscan is a small electronic device that reads the magnetic waves that make up our energy field. Combining biophysics, computer, and high-tech science, it provides analysis that captures dysbalance, stress, and imbalances of the energetic body field. 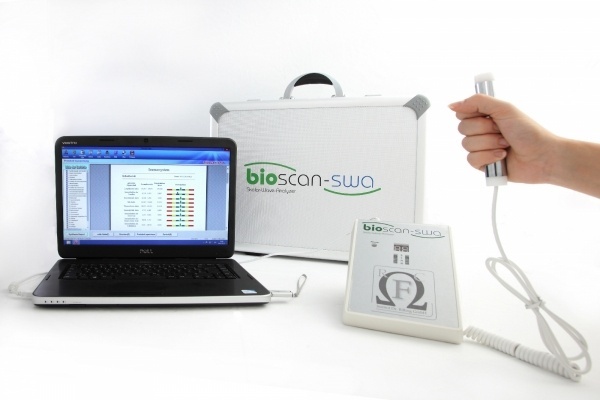 The Bioscan provides a snapshot for Lyfe Medical Wellness’s Dr. Sutthi to begin an exploration. Using the Bioscan is a simple procedure. Completely non-invasive, you hold a hot-dog-sized metal tube in one hand for a minute. Within this time it picks up your organs’ messages, relayed via your hand. The machine then translates your electronic waves into a handy report. 250 markers and nearly 50 organ zones are analyzed in that minute, including organ vitality, thyroid issues, hormone imbalances, toxicity (including heavy metals), kidney and liver functions, gastrointestinal functionality and so much more. It was a little mind-blowing to see the printed report, this two-page rainbow portrait of my health. With the report in hand, one for him, one for me, Dr. Sutthi took me through the results. My chronic digestive issues were documented, no surprises there; my genetically high cholesterol noted too. What was news to me was my stiffening blood vessels, the lead and mercury poisoning, and the minerals and vitamins I was lacking. I had been suspicious for a while that hormone and thyroid imbalances were a factor in my energy levels and the Bioscan also picked these up in the results. The Bioscan isn’t where the investigation ends. Combining the consult and Bioscan results, Dr. Sutthi was then able to recommend which blood tests would be helpful to further identify the exact health problem. And they did. The blood results confirmed both low and high hormone levels, endocrine issues and a poorly functioning thyroid. The doc is focused on food as thy medicine, with most of the recommendations to get me back to full health based on dietary changes, not a pharmacy-worth of pills. While the actual science of the Bioscan is beyond my high school-level science grades, I was able to see correlations from my current health condition to the Bioscan report. The blood tests ordered by Dr. Sutthi supported the Bioscan’s diagnosis and I became an instant advocate for using this impressive machine to pinpoint the body’s imbalances. For such an affordable and painless process, this is a great first-step in getting your health back on track. My sister wants to start her own medical practice, and I suggested she implement the new technology of Bio-scan into it. Your article had some great information regarding this, and I liked how you said that a Bioscan can let patients see correlations from current health conditions to the Bioscan report, and it can also pinpoint the body’s imbalances. Thanks; I’ll share this with my sister so she can implement Bioscan into her future medical practice.